The elderberry is a very popular plant that grows well in the garden as well as the wild. It is an excellent tree to grow that will attract wildlife to your garden and the flowers and berries can be harvested for a variety of uses. From delicious elderberry jams, wines, and pies to an effective and natural way to fight the flu, the elderberry is a very beneficial plant. It's definitely one you will want to know though it does come with a few precautions that are very important to understand as well. 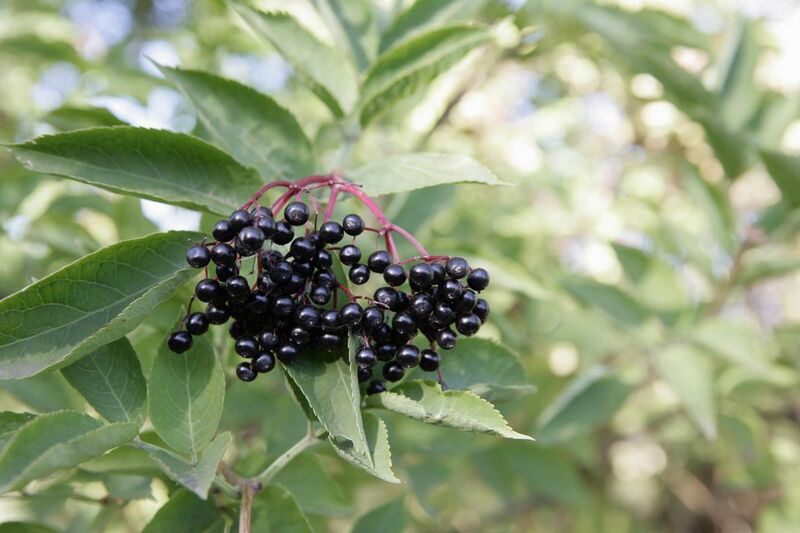 The elderberry grows as a tree and it is a wonderful addition to any edible garden. It also grows plentifully in the wild, particularly along river banks throughout the western parts of North America. This makes it a great wildcrafting plant though it's important that you correctly identify the tree prior to using any unknown berries. The elderberry tree can grow as tall as 20 feet and it is related to the honeysuckle. It often grows in a shrub-like cluster of stems though some varieties are smaller and single-stemmed. The serrated leaves of the elderberry grow along the twigs in groups of 3 to 9 leaves. They are aligned with each other in an opposite formation, meaning they do not line up from one side of the stem to the other but are staggered. In the spring, the fragrant flowers bloom in small clusters and are a waxy white color. These promote the coveted berries in autumn, so it's important to harvest only a portion of the flowers if you also want to enjoy the berries. In the garden, elderberry trees enjoy moist, well-drained soil and plenty of sun. They can also produce runners, so it's important to remove any unwanted shoots or they will take over your garden. You may have to wait 2 to 3 years after planting before your elderberry flowers and fruits. Propagating the elderberry is best done by seed as cuttings have a lower success rate. Luckily, as many berry-eating birds prove, the seeds take root very well and can produce a very healthy tree. Many nurseries offer a variety of elderberry plants as well. If you have a particular use in mind, be sure to ask if the variety you're buying is suitable. The elderberry is a fantastic flowering tree that has many uses and is a delight to harvest. However, it also comes with some risks that should be pointed out before anything else. The elderberry flower and berries are known to cause an allergic reaction in some people. Never harvest elderberry fruits that are not completely ripened. The immature fruits are poisonous and can cause nausea. For the same reason, it's advised to cook the berries rather than consuming them raw. Avoid the temptation to sample berries straight from the tree. Do not confuse the elderberry with other berry-producing trees. They may look similar, but red berries of similar species are known to be very toxic - look for dark purple or blue to blackberries. The flowers and berries from the elderberry can be harvested for use. As mentioned, it's important to harvest them at the right time in order to avoid any of the health concerns associated with the plant. The flowers of the elderberry tree should be harvested once the entire cluster has opened. Simply snip off the entire cluster of blooms. The berries will be ready to harvest when they are a rich, dark purple/black. They should also be slightly soft. Harvesting the berries is easy. They grow in large bunches called umbrellas and each stem can be removed once the berries ripe. The stem acts as a convenient handle when working with the berries, so don't cut it too short. If you notice any immature berries, remove them from your harvest. When wildcrafting elderberries, be sure to only pick from areas that do not receive a lot of vehicle traffic. One of the best-known uses of elderberry is for fighting the flu. The berries contain compounds that keep the flu virus from attaching to the body's cells, so it can shorten the duration of your illness and possibly lessen the severity. Elderberries make a wonderfully tasty remedy. You can use them fresh or dried to make a sweet elderberry syrup or a semi-sweet tincture. The berries can also be used to make a fruity jam or even a delicious pie. Tip: To dry elderberries, place them in a dehydrator or bake them lightly in the oven. They can also be spread out on a drying screen in a thin layer until dry. The intense fragrance of the elderberry flower is very relaxing and can be added to a calming potpourri mix. The flowers can be used to make a tea, liqueur, or wine as well.